How to Play: Help this family to cross to the other side of the bridge. Notice that: It is night time. There is only 1 lamp. 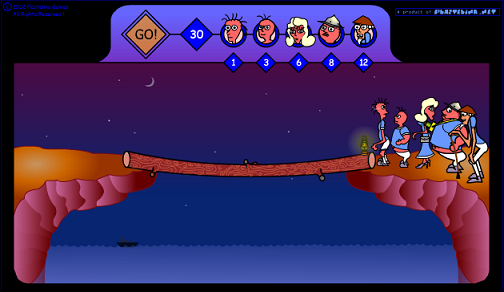 A maximum of two persons can cross the bridge at one time and they must have the lamp with them. Each person walks at a different speed: 1 sec, 3 sec, 6 sec, 8 sec, 12 sec respectively. A pair must walk together at the speed of the slower person. The lamp only has enough energy for 30 sec! How to play: At the top of the screen you'll see members of the family. Select two at a time. Then click GO! When two of them cross the bridge - select one of them to go back and bring the lamp to others and click GO. Then pick another pair to cross.